Lithium-ion and lithium-polymer batteries face several problems: they are not making great leaps forward that we hope for, they occasionally burst into flame, and they weigh too much to be all that practical in a pure-electric airplane. Researchers peer over the alternatives, magnesium, manganese, aluminum, and now, after several false starts in recent years, zinc. University of Sydney scientists claim to have found a three-stage method of charging zinc-air cells that promises greater energy density and longevity. One selling point – the relative abundance and low cost of zinc, such cells are cheaper to produce than lithium equivalents. 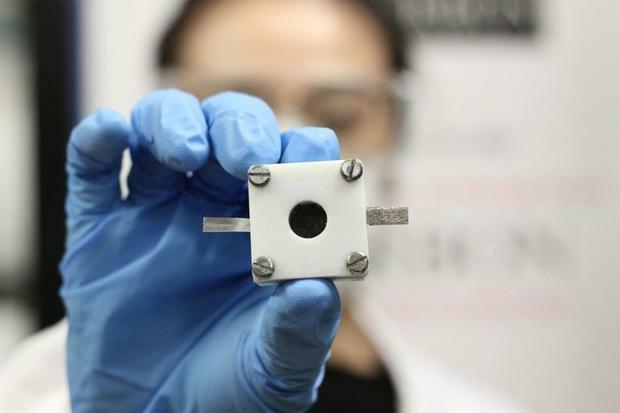 They theoretically can store up to five times more energy than lithium-ion cells, are less prone to burst into flame, and are even more environmentally friendly. What’s not to like? Until now, they’ve been difficult to recharge. ReVolt tried developing a rechargeable zinc-air battery with an ARPA-E (Advanced Research Projects Agency – Energy) grant, but gave up after two years. Explaining that the zinc-air batteries used in hearing aids were not rechargeable, ReVolt attempted to prevent the growth of dendrites, little follicles that eventually punch through the internal separators and cause short circuits. A lack of electrocatalysts that successfully reduce and generate oxygen during the discharging and charging of a battery have kept these potentially high-potential cells from success. But the paper published in the August 14 on-line edition of Advanced Materials, explains how the Sydney team and their partners at Nanyang Technological University developed a new three-stage method to overcome this problem and create an oxygen electrocatalyst at the heart of the research. The paper explains the three-steps. “These new catalysts are produced through the simultaneous control of the: 1) composition, 2) size and 3) crystallinity of metal oxides of earth-abundant elements such as iron, cobalt and nickel. They can then be applied to build rechargeable zinc-air batteries. “Paper co-author Dr Li Wei, also from the University’s Faculty of Engineering and Information Technologies, said trials of zinc-air batteries developed with the new catalysts had demonstrated excellent rechargeability – including less than a 10 percent battery efficacy drop over 60 discharging/charging cycles of 120 hours. It also demonstrates an excellent energy density of 904 Watt-hours per kilogram.